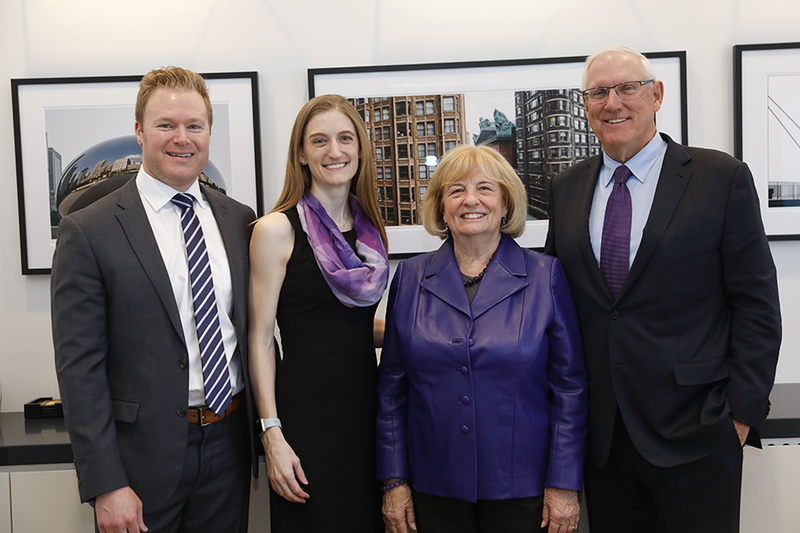 On Thursday, April 19, Northwestern Pritzker School of Law formally dedicated the south atrium addition as the Lanny and Sharon Martin Atrium, in recognition of the Martins’ extraordinary philanthropy and volunteer leadership. 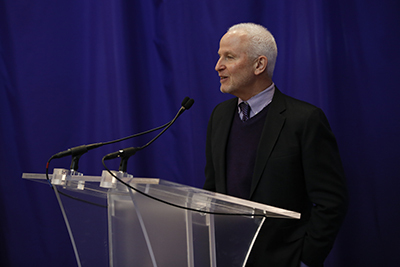 President Morton Schapiro speaks at the atrium dedication. The Martins chair the Law School’s Motion to Lead Campaign. Mr. Martin currently serves as the chairman of Northwestern University’s Board of Trustees and is a life member of Law Board. He established the J. Landis Martin Professorship of Law and Business in 2002. Mr. Martin is chairman and managing director of Platte River Equity in Denver. He founded the firm in 2006 after retiring as chairman and CEO of Titanium Metals Corporation, one of the world’s largest producers of titanium metal. Mr. Martin received an undergraduate degree in business administration from Northwestern University in 1968 and his JD from Northwestern Law in 1973. While at the Law School, he served as articles editor of the Northwestern University Law Review. Mrs. Martin earned her bachelor’s degree from Denison University, where she currently serves as a life trustee. She has been a leader in the Denver arts and education community for more than 30 years. She is also a member of the Northwestern University Women’s Board. The Martins have three children: Mary Lester; Sarah Stettner, who received an undergraduate degree from Northwestern in 2002 and a JD from the Law School in 2007; and Emily Martin Jones, who received her MD from Northwestern University Feinberg School of Medicine in 2008 and currently serves on the faculty. They also have seven grandchildren.